Lincoln reveals their refreshed MKS luxury sport sedan at LA, just as rival Cadillac begins to truly go global. Let&apos;s face it: Lincoln has a lot of work to do. Basically, they&apos;re 10 years behind cross-town rival Cadillac in terms of brand development and identity. And while Cadillac is now expanding to the global stage, Lincoln is still trying to find itself in a post Town Car era. 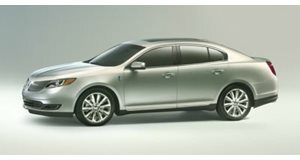 And now they unveiled their refreshed 2013 MKS sedan at this year&apos;s LA Auto Show and from what we can see, Lincoln has improved its styling. While nothing dramatic, stylists have basically done an evolution of the current theme, albeit with a bit more toned-down approach. The updates include a new grille, hood, front fenders, HID headlamps, front fascia, 19- and 20-inch aluminum wheels, decklid, rear fascia, LED tail lamps and exhaust tips. The interior has also been refreshed and features a new instrument panel and colors along with more premium materials. MyLincoln Touch, which has recently been upgraded, also returns along with standard Operator Assist and Wi-Fi hotspot functionality. Powertrain options will carry-over, with the 3.7-liter V6 receiving a boost in power from 274hp to 300hp and returns a respectable 19/28 mpg city/highway. The optional 3.5-liter EcoBoost V6 also remains, with an output of 355hp and 350lb-ft of torque. Returning 17/25 mpg city/highway, it also comes with standard AWD (the 3.7-liter is with FWD). Lincoln has also equipped the MKS with all-new braking hardware, which is supposedly a significant improvement over one of the outgoing model&apos;s biggest faults. Also standard is a new system called Continuously Controlled Damping (CCD), which monitors and adjusts the suspension. Algorithms react to the data by calculating the optimal damping force every 2 milliseconds, or 500 times per second. For example, CCD recognizes when the car is encountering a pothole and can instantly tighten damper control to prevent the wheel and tire from experiencing the full depth of the pothole. The system is so quick that inputs received at the front wheels are then used to prepare the rear wheels to deliver a more refined driving experience. Pricing was not announced, but Lincoln says the Chicago-built MKS will arrive in dealerships this spring.